Theoretically, boxing is a bracingly pure sport: two men hit each other until one of them falls over. Apart from bullfighting, it remains the modern world’s last remaining link to the primal brutality of the arenas of antiquity, the fighters acting as vessels for the aspirations and prejudices of the crowd. The iconography of the modern sport was configured in the early-mid 20th century: press photographs by the likes of Weegee and Hollywood B-movies of the 1940s and 50s continue to inform our perception of the spectacle. In cinema, the boxing narrative generally involves a heroic and inarticulate outsider, loved by his doting wife/girlfriend/mother/child, fighting against the odds to claim redemptive victory in an unequal contest. Films such as The Set-Up, Somebody Up There Likes Me, Requiem for a Heavyweight and, most recently The Fighter, all use this template or variations on it. Dramatically, the boxing movie format is as clear and simple as the sport itself. And whilst there are many notable boxing films made in colour (Rocky, The Champ, Fat City, etc.) it is significant that Martin Scorsese chose to make Raging Bull in black and white. Raging Bull is an explicit homage to the golden era of boxing – although the protagonist of his story, the real-life boxer Jake La Motta, was a far cry from the noble chump played by Robert Ryan in The Set-Up, a model of the classic boxing movie. In black and white, boxers are mythologised; and since we don’t see the colour of blood, the suffering is rendered more abstract and perhaps less vulgar. 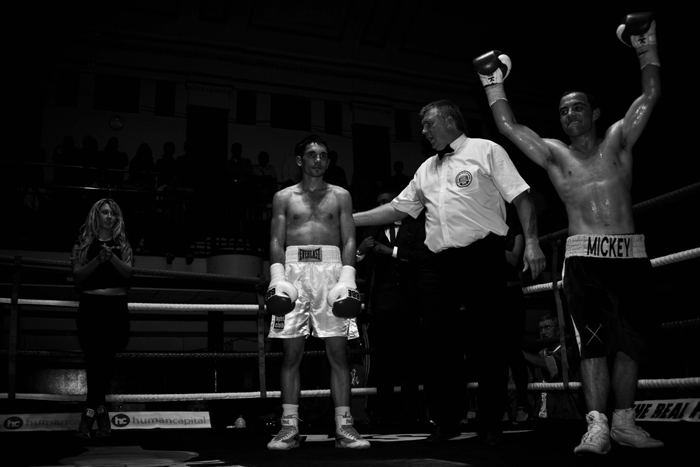 It is hard not to think of such precedents when looking at Alex Hocking’s pictures of boxers at Bethnal Green’s York Hall, a venue with a mythology of its own. This is not a sport inhabited by academic high achievers. Boxing allows these young men an opportunity for real-life redemption: intense, brightly-lit moments of aggression and pain in exchange for a shot at a better life. The picture above suggests a clear narrative for this particular fight: I don’t know anything about the boxers, what the outcome of the bout was, what interest – if any – the young woman took in the proceedings; but the image encourages me to imagine my own B-movie scenario for this particular match, featuring a noble and gifted newcomer, a tough but honest coach, a sick mother, a manipulative manager, a towering opponent and a girl with a heart of gold.